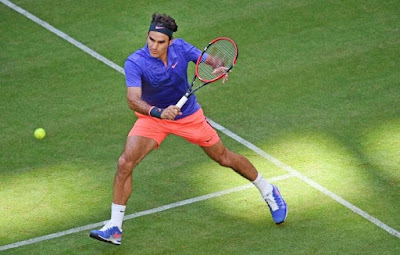 Roger Federer prevailed against top German Philipp Kohlschreiber 7-6(8), 3-6, 7-6(5) in a tricky first-round match between former Gerry Weber Open champions, Monday evening in Halle. In their fourth meeting at this German grass-court tournament, Federer saved two set points in the opening set tie-break before capitalising on his second set point opportunity. Kohlschreiber countered to take just his second set off the Swiss in nine meetings. He saved two match points in the tenth game of the third set and took the mini-break to go up 3-2 in the decisive tie-break, but seven-time champion Federer came back strong, winning the final three points to clinch the victory after two hours and 11 minutes. One interesting moment in the match came when Federer lost his footing after hitting a serve. He fell to the court but managed to get a racquet on the Kohlschreiber return while sitting on the ground to remain in the point. “I’m very relieved,” said Federer after the match. “Philipp served at 5-4 in the third set tie-break. It’s rough on grass, it takes two serves and maybe that’s it. “I wasted two match points at 5-4, 15/40 and then saved a break point at five-all, so it was a roller-coaster ride in the end. My nerves are still going a bit crazy right now,” laughed the World No. 2. “Philipp deserved winning, too. I first thought that I wasn't in luck today. But of course now I'm really happy that I made it through and I can go for another title. It would have been really bitter to have to fly back home today,” Federer said at being able to carry on with his mission title-holding. “I can't really say that I didn't do my best. We both played a good match. And when we both are in top form he is the better player.